Eyewear by the brand AGATHA, for Prescription glasses for Women, with reference M0009591, with a(n) Modern, Female and Retro/Vintage style.These Agatha 61428 527 53 15 have a(n) Full Rim frame made of Acetate / plastic with a(n) Clubmaster shape in Silver and Beige colours. Their size is 53mm and their bridge width is 15mm, with a total frame width of 68mm. These glasses are suitable for prescription lenses. These are top of the range glasses from the brand AGATHA, made of high-quality materials, modern eyewear that will give you a look that matches your image. Buy Agatha 61428 527 53 15 eyewear in an easy and safe way at the best price in our online store. 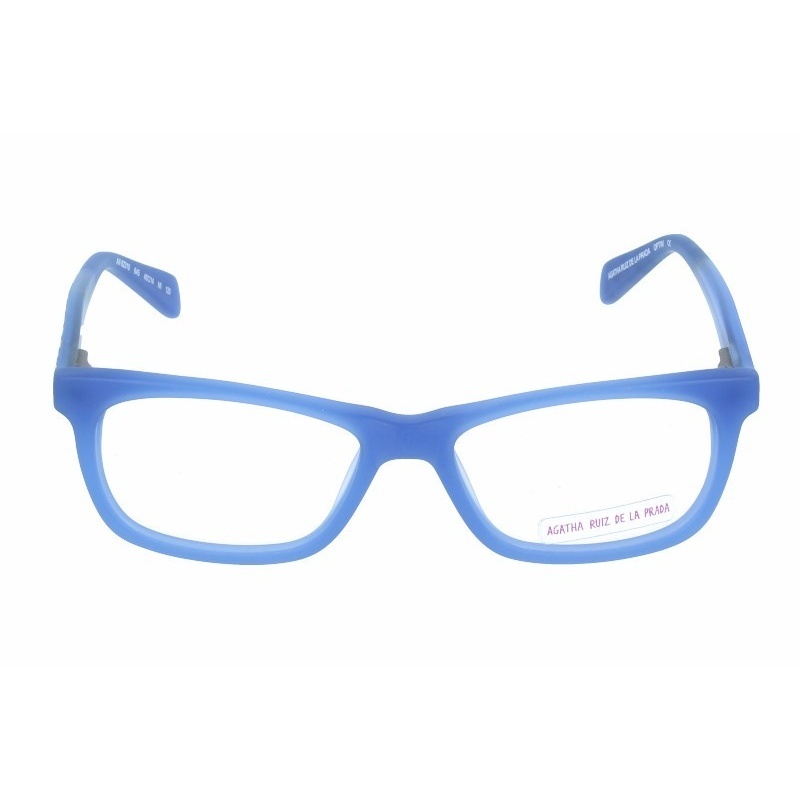 Eyewear by the brand AGATHA, for Prescription Glasses for Children, with reference M0009791, with a(n) Modern and Retro/Vintage style.These Agatha 62310 645 45 14 have a(n) Full Rim frame made of Acetate / plastic with a(n) Retro-Wayfarer shape in Yellow and Blue colours. Their size is 45mm and their bridge width is 14mm, with a total frame width of 59mm. These glasses are suitable for prescription lenses. These are top of the range glasses from the brand AGATHA, made of high-quality materials, modern eyewear that will give you a look that matches your image. 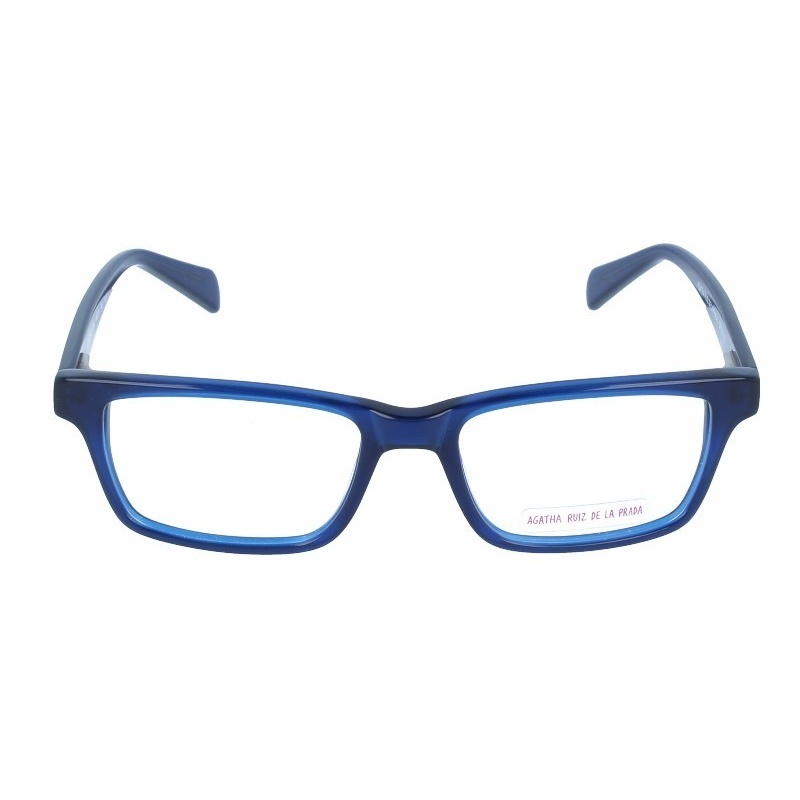 Buy Agatha 62310 645 45 14 eyewear in an easy and safe way at the best price in our online store. string(131) "Buy Agatha 62310 645 45 14 eyeglasses. Modern and elegant model. Original product with fast shipping, quality guarantee and refund." string(22) "AGATHA 62310 645 45 14"
Eyewear by the brand AGATHA, for Prescription glasses for Women, with reference M0009796, with a(n) Formal, Modern and Female style.These Agatha 61446 245 52 15 have a(n) Full Rim frame made of Metal with a(n) Square shape in Blue colour. Their size is 52mm and their bridge width is 15mm, with a total frame width of 67mm. These glasses are suitable for prescription lenses. These are top of the range glasses from the brand AGATHA, made of high-quality materials, modern eyewear that will give you a look that matches your image. Buy Agatha 61446 245 52 15 eyewear in an easy and safe way at the best price in our online store. string(131) "Buy Agatha 61446 245 52 15 eyeglasses. Modern and elegant model. Original product with fast shipping, quality guarantee and refund." string(22) "AGATHA 61446 245 52 15"
string(233) "Ágatha Ruiz de la Prada flashy style never gets unnoticed. The use of basic rounded and geometric shapes is also applied on her glasses designs. Colour, freshness, optimism and energy are the best words to describe her eyewear line." Eyewear by the brand AGATHA, for Prescription Glasses for Children, with reference M0009773, with a(n) Modern and Retro/Vintage style.These Agatha 61433 846 49 18 have a(n) Full Rim frame made of Acetate / plastic with a(n) Retro-Wayfarer shape in Blue colour. Their size is 49mm and their bridge width is 18mm, with a total frame width of 67mm. These glasses are suitable for prescription lenses. These are top of the range glasses from the brand AGATHA, made of high-quality materials, modern eyewear that will give you a look that matches your image. Buy Agatha 61433 846 49 18 eyewear in an easy and safe way at the best price in our online store. string(131) "Buy Agatha 61433 846 49 18 eyeglasses. Modern and elegant model. Original product with fast shipping, quality guarantee and refund." string(22) "AGATHA 61433 846 49 18"
Eyewear by the brand AGATHA, for Prescription Glasses for Children, with reference M0009789, with a(n) Modern style.These Agatha 62303 244 47 16 have a(n) Full Rim frame made of Metal with a(n) Cat Eye shape in Havana, Blue and Orange colours. Their size is 47mm and their bridge width is 16mm, with a total frame width of 63mm. These glasses are suitable for prescription lenses. These are top of the range glasses from the brand AGATHA, made of high-quality materials, modern eyewear that will give you a look that matches your image. Buy Agatha 62303 244 47 16 eyewear in an easy and safe way at the best price in our online store. string(131) "Buy Agatha 62303 244 47 16 eyeglasses. Modern and elegant model. Original product with fast shipping, quality guarantee and refund." string(22) "AGATHA 62303 244 47 16"
Eyewear by the brand AGATHA, for Prescription Glasses for Children, with reference M0009086, with a(n) Modern and Retro/Vintage style.These Agatha 62312 544 46 16 have a(n) Full Rim frame made of Acetate / plastic with a(n) Square shape in Blue colour. Their size is 46mm and their bridge width is 16mm, with a total frame width of 62mm. These glasses are suitable for prescription lenses. These are top of the range glasses from the brand AGATHA, made of high-quality materials, modern eyewear that will give you a look that matches your image. Buy Agatha 62312 544 46 16 eyewear in an easy and safe way at the best price in our online store. string(131) "Buy Agatha 62312 544 46 16 eyeglasses. Modern and elegant model. Original product with fast shipping, quality guarantee and refund." string(50) "AGATHA 62312 544 46 16 - Eyeglasses | Opticalh.com"
string(22) "Agatha 62312 544 46 16"
Eyewear by the brand AGATHA, for Prescription Glasses for Children, with reference M0008452, with a(n) Modern style.These Agatha 62303 248 47 16 have a(n) Semi Rimless frame made of Metal with a(n) Cat Eye shape in Blue and Jaspe colours. Their size is 47mm and their bridge width is 16mm, with a total frame width of 63mm. These glasses are suitable for prescription lenses. These are top of the range glasses from the brand AGATHA, made of high-quality materials, modern eyewear that will give you a look that matches your image. Buy Agatha 62303 248 47 16 eyewear in an easy and safe way at the best price in our online store. string(131) "Buy Agatha 62303 248 47 16 eyeglasses. Modern and elegant model. Original product with fast shipping, quality guarantee and refund." string(197) "agatha 62303 248 47 16,shape,unisex,acetate,metal,rectangular,rounded,squared,youthful,temples,lenses,organic,prescription,monofocal,quality,price,discount,economical glasses,original glasses,metal"
string(50) "AGATHA 62303 248 47 16 - Eyeglasses | Opticalh.com"
string(22) "Agatha 62303 248 47 16"
string(131) "Buy Agatha 53032 244 49 16 eyeglasses. Modern and elegant model. Original product with fast shipping, quality guarantee and refund." string(193) "shape,unisex,acetate,metal,rectangular,rounded,squared,youthful,temples,lenses,organic,prescription,monofocal,quality,price,discount,economical glasses,original glasses,metal,dark blue,sky blue"
string(50) "AGATHA 53032 244 49 16 - Eyeglasses | Opticalh.com"
string(22) "Agatha 53032 244 49 16"
Eyewear by the brand AGATHA, for Men's eyeglasses, with reference M0008449, with a(n) Formal and Modern style.These Agatha 50235 644 53 18 have a(n) Full Rim frame made of Acetate / plastic with a(n) Square shape in Havana and Blue colours. Their size is 53mm and their bridge width is 18mm, with a total frame width of 71mm. These glasses are suitable for prescription lenses. These are top of the range glasses from the brand AGATHA, made of high-quality materials, modern eyewear that will give you a look that matches your image. Buy Agatha 50235 644 53 18 eyewear in an easy and safe way at the best price in our online store. string(131) "Buy Agatha 50235 644 53 18 eyeglasses. Modern and elegant model. Original product with fast shipping, quality guarantee and refund." string(144) "unisex,acetate,rectangular,square,youthful,temple,lens,organic,graduate,monofocal,quality,price,discount,reasonable prices,dark blue and havana." string(50) "AGATHA 50235 644 53 18 - Eyeglasses | Opticalh.com"
string(22) "Agatha 50235 644 53 18"